GayLea's 24 Days Of Cookies Contest is back! 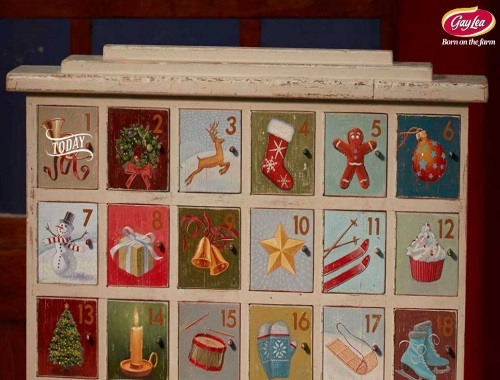 Enter to win a fresh batch of cookies each day by opening the daily door on the calendar to reveal a holiday cookie! Each door opened earns you one ballot towards their daily prize and the grand prize! Click again and get a recipe and a virtual cookie, you can eat it or in the spirit of giving send it to a friend on Facebook. Whether you eat it or give it away, you are still entered into the draw. Each door locks after 24 hours. KITCHENAID® Scraper Spatula with an ARV of $17.32 (CDN). each consisting of twelve (12) to twenty-four (24) fresh baked cookies based on a recipe as selected by the Sponsor and baked by the Sponsor’s food stylist. The ARV of each Daily Prize is $50.00 (CDN). Contest closes December 24, 2017. Quebec is excluded.